NEAR THE TRAIL’S END (1931, Tiffany) Bob Steele, Marion Shockey, Hooper Atchley. A nice print of a somewhat obscure Steele vehicle. A pretty young lady finds her life in danger when she witnesses a couple of cold-blooded slayings. Bob comes to her aid and tries to help her identify the killers. A good early B western. From a nice 16mm print. BIG CALIBRE (1934, Supreme) Bob Steele, Peggy Campbell, Perry Murdock. A mad chemist kills Bob's dad with poison gas and steals the family fortune. Bob searches for the killer, prospecting on the side. He finds him in a small town, wearing a sinister disguise and in cahoots with a gangster. The chase between horse and auto is terrific. A top western with a dash of horror. 16mm. THE RED ROPE (1937) Bob Steele, Lois January, Forrest Taylor, Charlie King. Bob is a cowboy with a mysterious past. A desperado known as Rattler Hayne is after him and tries to disrupt his wedding service. In a wedding gift they find three bullets and a red rope--a sign that Bob is marked for death. 16mm. 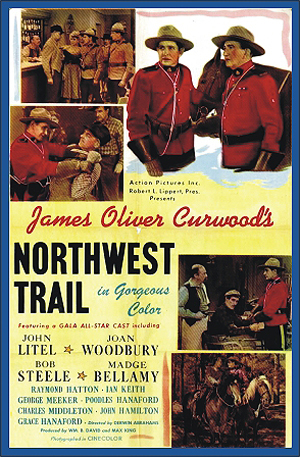 NORTHWEST TRAIL (1945, Screen Guild) Bob Steele, Joan Woodbury, John Litel, Ray Hatton. Bob’s a Mountie trying to solve a ruthless murder in this color western adventure. One early scene has Bob trying to fix Woodbury's car while she does her best to infuriate him. Bob puts her in her place. One of Bob’s last starring roles. From a sharp 16mm cinecolor print.